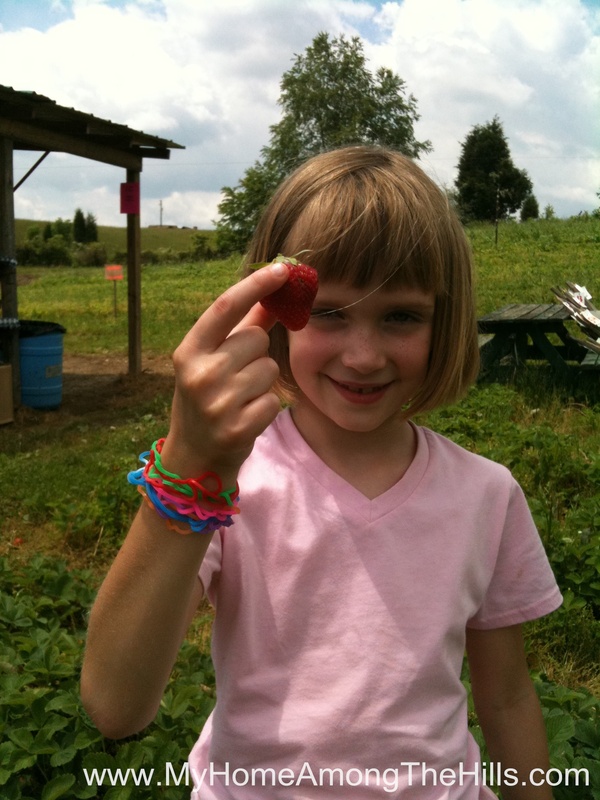 We went to a you-pick strawberry place in Cottageville, WV on Sunday. It’s about 35 minutes away (though for the kids, it was a 2 year long trip) and was a nice Sunday drive. 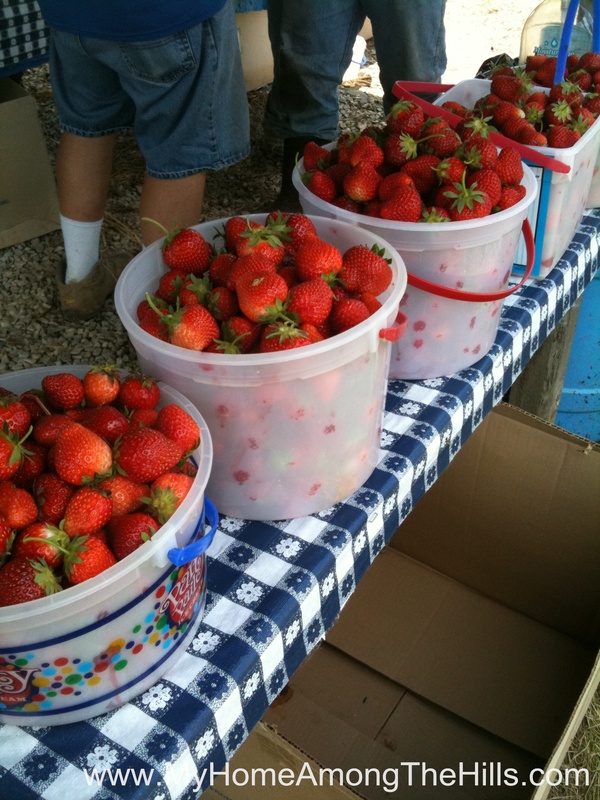 We got to Hartley Farms and found a huge field of the biggest and best strawberries I have ever seen (though I didn’t know that part right away). The proprietor took us over to a row and told us to, “have at it”. 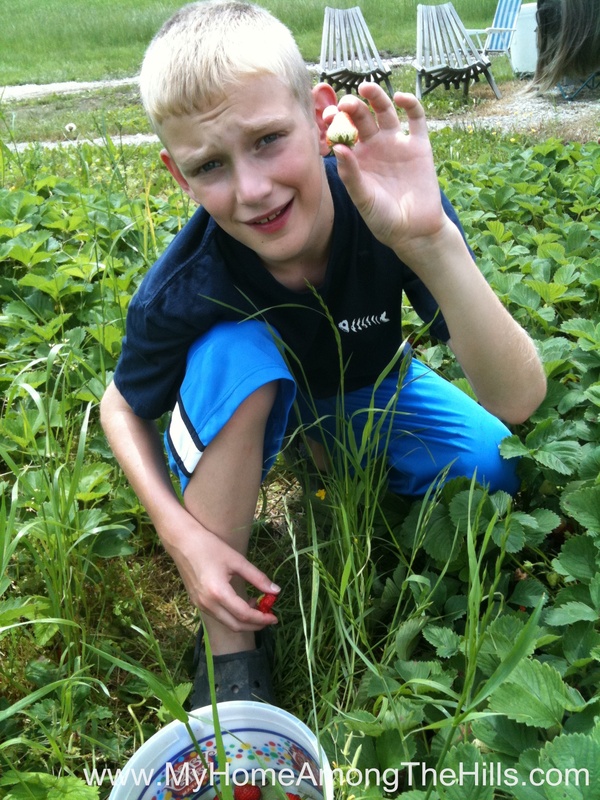 I fully expected to have to search and dig and really work to find a few scrawny strawberries. We picked 2 years ago at a place closer to home and it was pitiful. 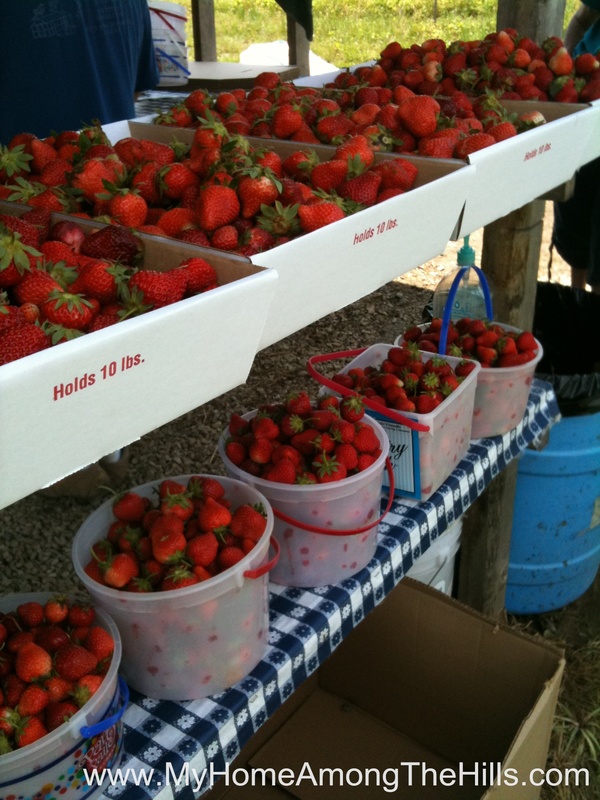 Hartley Farms was $0.55 per pound cheaper and there were hundreds of big fat berries everywhere! We filled 7 ice cream buckets to overflowing and weighed in. All told, we had about 32 pounds of berries! The best part is that the kids even helped pick! We jumped in the car hoping to get home before Isaac ate every last strawberry. Though he made a run at eating 32#, we did make it home with a few berries. All four of us started making jam though the kids were tired after a batch each. They wanted to take a jar to their teachers that they had made. Emily and I continued on into the night making jar after jar of jam. Isaac in particular like strawberry jam so the 43 half-pints we made may last us the year (and may not). 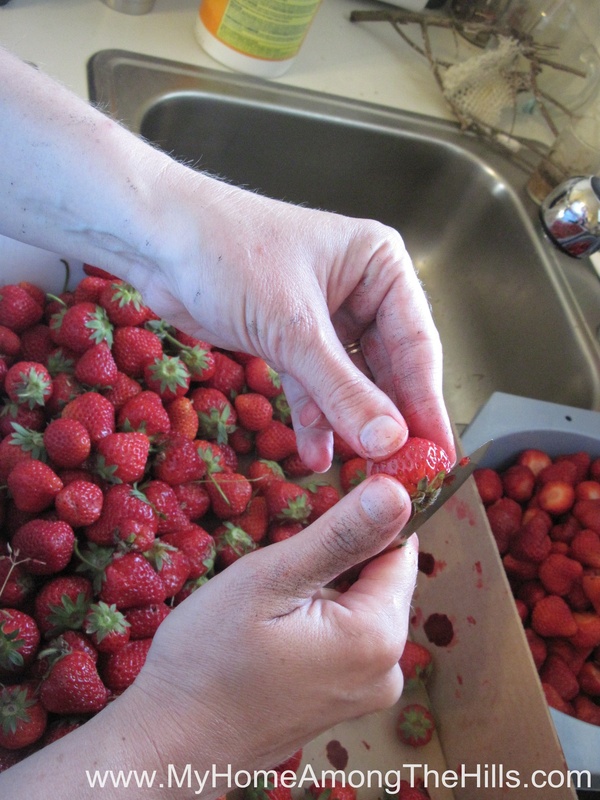 We still have somewhere around 8 pounds of berries to go…not sure if that will be jam or something else yet. We have a fair bit of cleanup yet to do. Of course, it is impossible to make jam without making stuff sticky and our floor is sticky indeed. I have mopped it several times but my socks still leave little fuzzy footprints when I walk in the kitchen. 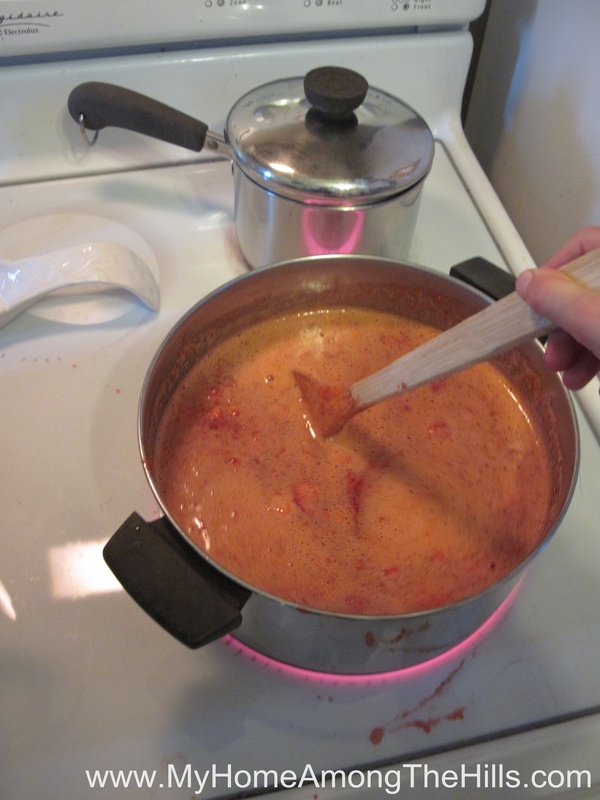 And by the way, when you make strawberry jam, make sure you use a huge pot to boil your mixture. 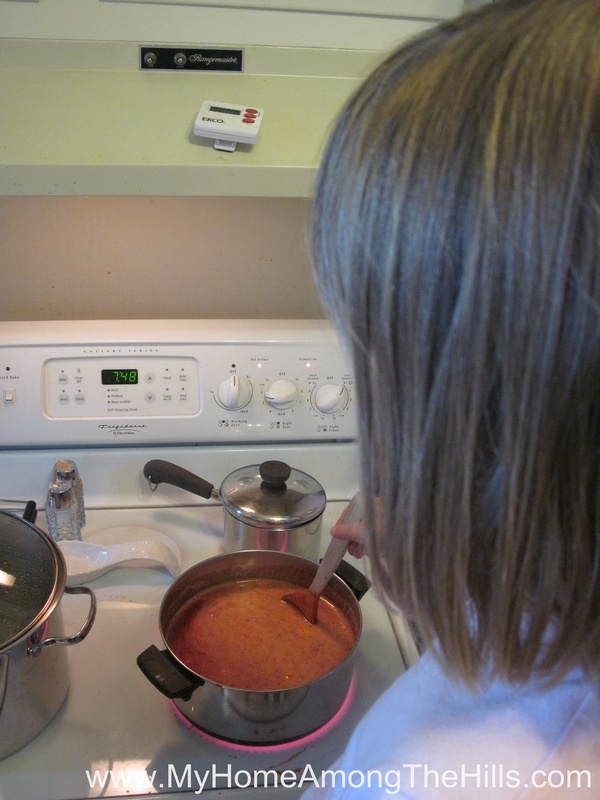 We forgot since last time and we boiled a pot of sticky strawberry syrup over the edge of the sauce pan we had and onto the hot burner on our (wretched) glass-topped stove. You guessed it…it caramelized and tried to burst into flame. 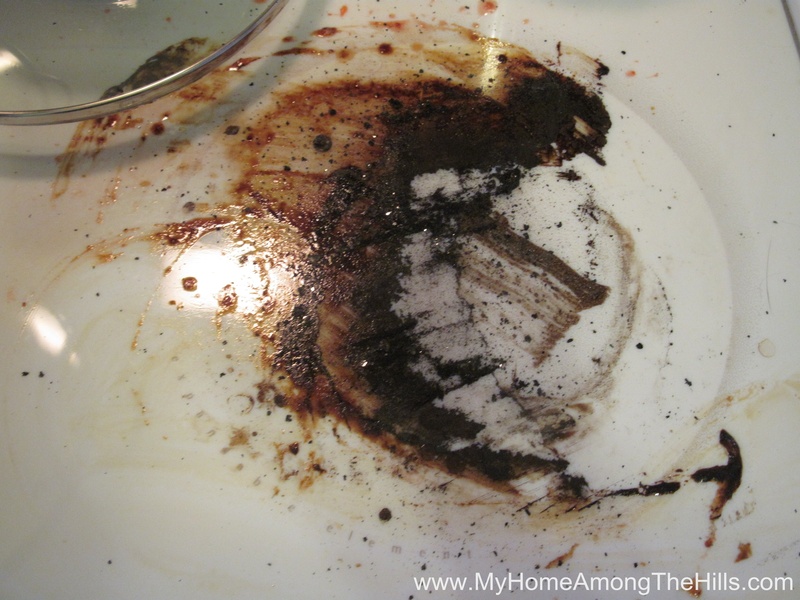 We never saw fire, but our house was full of smoke before I could get the mess cleaned up…so, word to the wise, use a huge pot to boil the mix! Luckily we had a better pot so subsequent batches were fine! It was fun to clean up too! .-= tipper´s last blog ..Blooming Ivy OR Is It Blooming Mountain Laurel? =-. 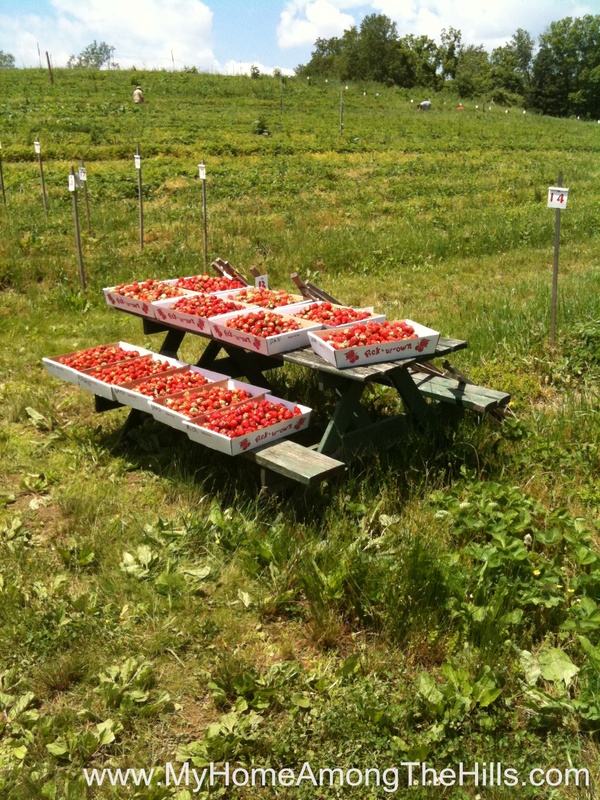 My solution to overenthusiastic strawberry picking is to freeze the excess on trays, transfer to freezer bags and store for future jam making or smoothies. I see a strawberry pie in the works for tonight. 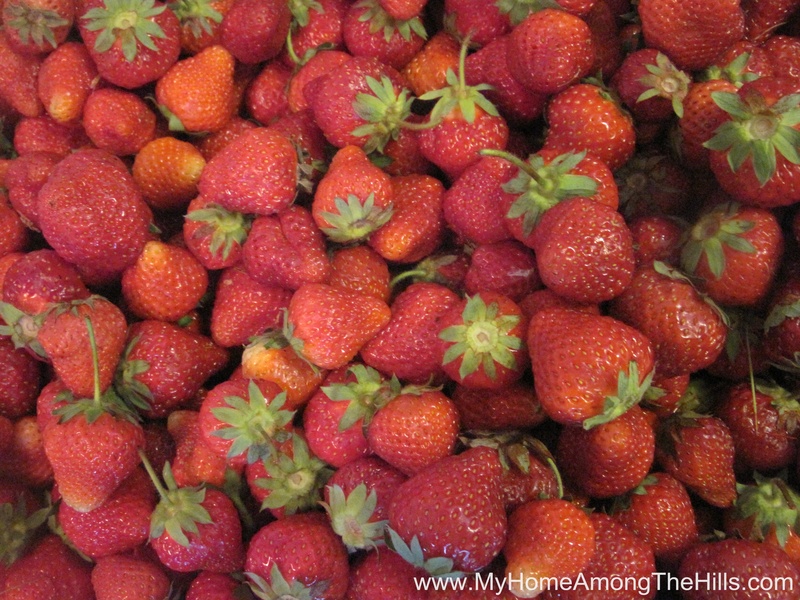 We will definitely make some more jam as I have enough strawberries prepared for 2 more batches. We might try freezing some, although we have a wretched side by side refrigerator and no other freezing options, so there is not much room. I just love this time of year! .-= YDavis´s last blog ..Golden Friday – You don’t know Jack =-. .-= Caprilis´s last blog ..Crossing Things Off the Wish List =-. I love freezer Jam the best but with limited freezer space makes it difficult. Freezing for smoothies sounds good too. .-= Capri Kel´s last blog ..Three Days =-. We ended up making the rest into pie…no smoothies from this batch! .-= Dora Wilkerson´s last blog .. =-.